I've been teaching Italian cooking for years at my school in Midtown NYC, and the thing that seems to scare people off more than anything is making bread. Maybe it's the fear that, left to its own devices, yeast will take over the kitchen--just think of dough ballooning out of the oven in that episode of "I Love Lucy". But I've found that once people get their hands into the dough and get familiar with how yeast works, the fear disappears. All it takes is understanding a few rules, getting comfortable with basic techniques such as kneading and shaping the dough, and a reliable recipe. You can get all three of the above right here. Whether you're making bread, focaccia, pizza, or any other yeast-risen dough, the principles are the same. It's all about temperature, ingredients, and technique. It's amazing to think that from only flour, water, and yeast (and maybe a little salt for flavor) one can create an amazing array of baked goods. The same ingredients will yield entirely different breads depending on how and in what quantity they are combined, and how the final dough is shaped and baked. Add to that all the possible flavorings and enriching agents (eggs, milk, sugar, and so on) and you can see that the possibilities truly are endless. There can be no risen bread without yeast. Yeast is a living organism that extracts oxygen from sugars in flour to produce carbon dioxide and alcohol when it comes into contact with water. The gases that form are then released, creating gas bubbles in the dough and making the dough rise: the first, miraculous step in bread baking. In the past, people had to rely on wild yeasts in the air or homemade yeast starters to make leavened bread. Unless you intend to make your own yeast starter (which is very satisfying, but is also quite tricky and time-consuming to maintain), you can use one of three forms of commercial yeast: instant (also known as rapid rise), active dry, or compressed cake yeast. There is very little difference between instant and active dry yeast: both are minute granules of dried yeast. Instant yeast is tinier and slightly more potent than active dry yeast. But the main difference between instant and active dry yeast is that instant yeast can be added directly to flour, whereas active dry yeast needs to be dissolved in warm liquid before it is combined with flour. 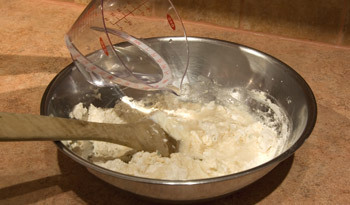 Compressed cake yeast, which is sold in a block in the refrigerated section of supermarkets, also needs to be dissolved in warm liquid before it is mixed with flour (otherwise it will form a discernible mass in the dough). Because it's more convenient, I use instant yeast, and recommend you do too. Instant, active dry, and compressed cake yeast vary in potency (the most powerful is instant, followed by active dry, and finally compressed cake yeast), so I suggest you adjust quantities of yeast in a given recipe if you substitute one type of yeast for another: one cube of compressed cake yeast, which weighs .6 ounces, is equivalent in potency to 2 and 1/2 teaspoons of active dry yeast and 2 teaspoons of instant yeast. Purchase yeast from a reputable source to be certain it is fresh: if the yeast is dead, the dough won't rise no matter how good your recipe is or how skillfully you knead, shape, and bake the bread. Instant, active dry, and compressed cake yeast are available from King Arthur Flour. Store yeast in the refrigerator, tightly sealed in order to keep out humidity. Yeast is temperature-dependent: it falls asleep (i.e., becomes inactive) in extremely cold temperatures, speeds up in moderate temperatures, and dies in extremely hot temperatures. Use warm, but not hot, water or liquid when mixing bread dough: 110 degrees is just right, activating the yeast without running the risk of scalding it and killing it (an instant-read thermometer is a must for foolproof baking, and can be bought from King Arthur Flour or Sur La Table). Yeast produces carbon dioxide faster in warmer temperatures. 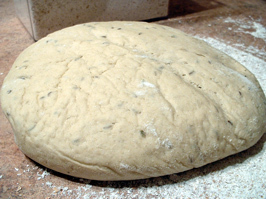 As a result, dough rises more slowly in the refrigerator than at room temperature or near the pilot light of the oven. Low-temperature, slow rises result in bread with more character; in practical terms, this means that you can make a batch of bread dough, refrigerate it overnight, and bake it the next day. When you are ready to bake, preheat the oven (preferably with a baking stone in it); anywhere from 375 to 475 degrees is the norm. In general, larger breads call for lower temperatures to avoid burning the crust, and flat ones such as focaccia or pizza call for higher temperatures to produce a crisp crust. Once the bread goes in the oven, the intense heat causes the yeast to die, but not before the last dramatic rise, called ovenspring, occurs. The type of flour you use will have an enormous effect on the texture and flavor of your bread. 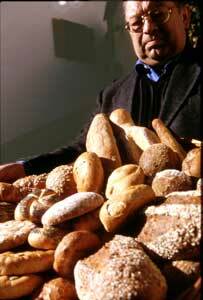 The most important consideration as far as yeasted doughs is concerned is the protein content of flour. Protein content determines how much liquid the flour will absorb, as well as how much gluten will develop in the dough. The higher the protein content in flour, the more liquid the flour will absorb, and the more gluten will form in the dough. All-purpose flour generally contains from 8 to 12 percent protein; by contrast, bread flour (also called high-gluten flour) typically contains 11.5 to 14 percent protein. 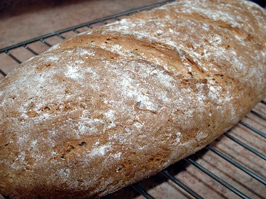 All-purpose flour yields bread with a more tender crumb than bread flour, which in turn produces more toothsome bread. I prefer chewy, crusty loaves of bread with large air holes and pizza with a crisp crust, so I use bread flour for bread and pizza; for focaccia, however, which I like slightly more tender, I use all-purpose flour. Pastry and cake flours, which contain roughly 8 to 9 percent protein, are too low in protein to be used in most yeasted doughs (except perhaps croissants and other yeast-raised pastries). King Arthur Flour is my favorite source for high-protein flours. Whole wheat flour contains about 12 to 14 percent protein, but the bits of bran it contains cut through the gluten strands in the dough; as a result, doughs that contain a significant amount of whole wheat flour rise less than yeasted doughs made without whole wheat flour. Specialty flours like millet, corn, and rye are low in protein and have no gluten-forming abilities; when using these in your yeasted doughs, add bread or all-purpose flour, or add some vital wheat gluten to compensate. A little trick: when using specialty flours such as rye or millet, dissolve instant yeast in a little liquid before adding it to the dry ingredients; this gives the yeast a head start, which helps to compensate for the lesser gluten-forming abilities of the flour. For thousands of years, bread has been a subsistence food in Italy, and breads have been made with the most inexpensive ingredients available: water, flour, yeast, and salt. For special occasions, doughs have been enriched with eggs, milk, and fats, but these feast-day breads were the exception rather than the rule. 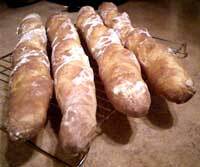 I prefer the rustic texture of simpler breads, and use water for all my yeasted doughs: basic Italian loaves such as filoncini (see the recipe below), rustic Apulian loaves, focaccia both plain and embellished, pizza, and more. To change the character of your bread, however, you can add other ingredients to the dough. Whole eggs and egg yolks make a richer dough, while egg whites make a drier dough. Milk makes a softer dough with a more tender crumb, wine a drier one. Fats like extra-virgin olive oil and unsalted butter result in a cakier texture (but they should be added after some liquid has been worked into the flour, or they will coat the proteins and prevent gluten strands from forming). The techniques essential to turning out a good loaf of bread are proper mixing, kneading, rising, shaping, and baking. Mixing is the first step in the bread making process; it blends the ingredients in the dough and traps air bubbles (gas) inside. Mixing can be done with a wooden spoon if you are going to knead the dough by hand, with the flat paddle of an electric mixer, or in a food processor. To mix by hand, place the dry ingredients in a large bowl; pour in the warm liquid as you stir with a wooden spoon, adding only as much liquid as necessary to form a rough, shaggy dough. To mix in an electric mixer, place the dry ingredients in the mixer bowl and add the warm liquid as you beat with the paddle attachment until the dough gathers around the paddle. To mix in a food processor, pulse the dry ingredients once or twice to blend; add the warm liquid through the feed tube while the machine is running until the dough forms a ball around the blade. Kneading (which, like mixing, can also be done by hand, in an electric mixer, or in a food processor) allows the proteins and the water in the dough to connect and form gluten. 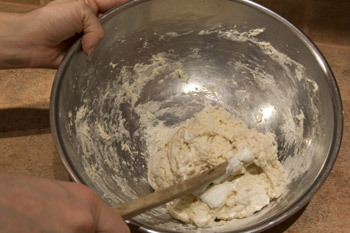 To knead by hand, turn the rough, shaggy dough you mixed in the bowl out onto a floured counter; with the heel of your hand, stretch the dough out in front of you, then give it a quick quarter-turn and pull it back toward you; repeat the process for 8 to 10 minutes, or until the dough is silky and smooth. As you knead, add sprinkles of flour if needed to prevent the dough from sticking to your hands or the counter. To knead in an electric mixer, switch from the paddle attachment you used for mixing to the dough hook; knead for 5 to 8 minutes on medium speed, adding sprinkles of flour if the dough is sticky. To knead in a food processor, process for 45 seconds after the dough forms a ball around the blade; longer processing will overheat the dough and may cause the gluten strands to come undone. The dough is kneaded sufficiently when it is satiny, elastic, and springs back when poked with a finger. You are better off with a moderately wet and soft dough rather than a dry, stiff dough; softer, wetter doughs yield bread with larger air holes and a looser, more uneven crumb. Resist the temptation to add too much flour when mixing or kneading, and you will be rewarded with memorable bread. 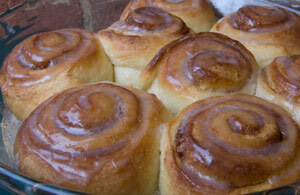 Most yeasted doughs rise twice: once immediately after kneading, and once after shaping. When the dough is properly kneaded, shape it into a ball, place it in a lightly floured or oiled bowl, turn it to coat with the flour or oil, and cover it with plastic wrap or a moist towel. Set aside at room temperature or in the refrigerator to rise until doubled. Rising time will vary depending on the composition and texture of the dough (enriched doughs rise more slowly, as do very firm or very wet doughs), as well as the temperature (yeast is activated by heat and slowed down by cold, so to promote a slow rise, set the kneaded dough to rise in the refrigerator, where it will develop more character). 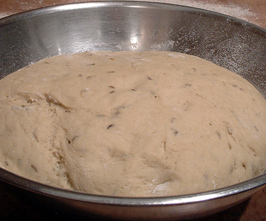 After the first rise, the dough is generally ready to be shaped, then set aside to rise a second time. The second rise takes roughly half as long as the first rise, because shaping redistributes the yeast cells, giving them new food to feast on and encouraging them to multiply further. If kneading is best done vigorously to encourage the formation of gluten, shaping is best done gently to leave as many air bubbles intact as possible: this produces a lighter bread with a more uneven, rustic crumb. Once the dough is shaped, leave it at room temperature, covered, to rise as the recipe specifies. Don't allow shaped loaves to overrise before baking, or they will fail to rise as they should in the oven; loaves usually need to increase by half their volume after shaping. There are three rules to baking great bread: preheating the oven a minimum of 30 minutes before baking, using a baking stone for a crisp crust, and misting with water during the first 10 minutes of baking (also for the sake of the crust). 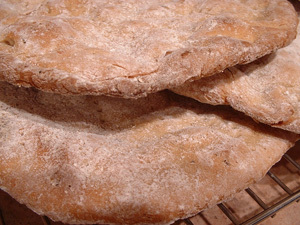 In general, smaller or flatter breads should be baked at high temperatures (as high as 550 degrees in some cases), larger breads at 400 to 450 degrees. When the bread sounds hollow on the bottom, is a lovely golden color, and registers between 200 and 210 degrees internal temperature, it is ready to come out of the oven. This creamy onion and bacon pie tastes best when baked directly on a hot baking stone, because the intense and evenly maintained heat emulates a wood-burning oven. If you don't have a baking stone, preheat a rimmed black baking sheet at 550 degrees for 30 minutes, and slide the focaccia onto it. 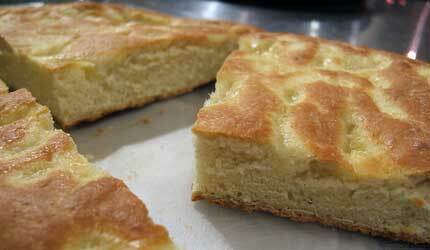 This focaccia is spectacularly good and comforting. 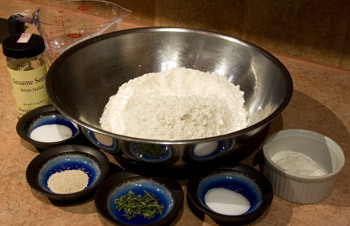 Make the dough: Place the flour, yeast, sugar, and salt in the bowl of a food processor. With the machine running, add enough warm (110 degrees) water (about 1 and ½ cups) to make a soft dough that does not stick to the sides of the processor bowl; process for 45 seconds. If the dough is dry, add a little more water; if it is sticky, add a little more flour. Turn out onto the counter, knead 1 minute, and shape into a ball; place in a lightly oiled bowl and cover. 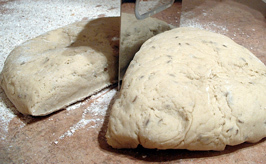 Allow the dough to rise until doubled in the refrigerator for 8 to 24 hours (or at room temperature 1 to 2 hours), and bring to room temperature before proceeding. When you are ready to bake the focaccia, preheat the oven with a baking stone in it to 500 degrees (preferably set on convection bake). Make the topping: Melt the butter in a deep, wide skillet. Add the onions, bacon, salt, and pepper, and cook over medium-low heat for 30 minutes, or until caramelized; don't stir too often or the onions won't caramelize. Remove to a bowl; add the nutmeg, Mascarpone, and Parmigiano, and adjust the seasoning if needed. Cool to room temperature. Line an 11-inch x 17-inch baking sheet with parchment paper and grease it generously with olive oil. Using the pads of your fingers and being careful not to tear the dough, press the dough and flatten it so it covers the bottom of the baking sheet. Lightly oil the top of the dough. (If the dough resists as you flatten it, let it rest 5 minutes, then try again.) Let rest 15 minutes. Spread the cooled topping over the dough, leaving a ½-inch border all around. Flip the edges of dough over the filling to enclose, creating a border so that the filling will not leak out as the focaccia bakes. Try rosemary salt or crushed fennel seeds instead of the sesame seeds for a delicious herbal flavor. Make the dough: Combine the flour with the yeast and salt in a large bowl. Mix well with a wooden spoon. Add enough warm water to form a soft dough that holds together and forms a mass around the wooden spoon. Turn the dough out on a very lightly floured counter and knead for 1 minute. This redistributes the yeast throughout the dough and makes for a lighter dough. Return to the bowl (or freezer bag) and cover with plastic wrap. Let rise at cool room temperature until doubled again, about 1 and ½ to 2 hours. To bake: Preheat the oven to 425 degrees. Dust 4 parchment paper-lined baking sheets with the cornmeal. Turn the risen dough out onto a lightly floured counter. Without deflating it, cut it into 4 pieces. Working delicately so as to avoid deflating the air bubbles in the dough, flatten each piece into a ½-inch-thick rectangle. 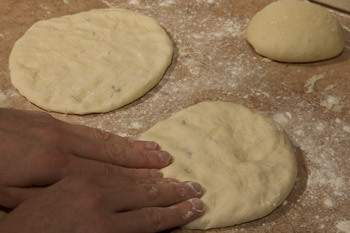 Rub each piece of dough with olive oil and sprinkle with salt and the seeds. Using a sharp dough scraper, cut into ¼-inch-wide logs. Stretch each log into rough breadstick shape and arrange on the cornmeal-dusted parchment paper. Cover with plastic wrap and let rest for 20 minutes. 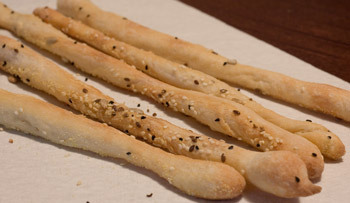 Bake the breadsticks in the preheated oven for 17 minutes, or until golden and crisp, misting with water from a spray bottle 3 times during the first 10 minutes of baking (you will likely need to do this in 2 batches since most home ovens have only 3 racks). Make a dough by combining 2 and 1/2 cups of unbleached all-purpose flour, 1 teaspoon sea salt, 1 teaspoon sugar, 1 teaspoon instant or rapid-rise yeast, 1 tablespoon minced thyme leaves, and 1 tablespoon of the sesame seeds in a bowl (you will need the remaining tablespoon of sesame seeds for sprinkling on the dough just before grilling it). Using a wooden spoon, stir 3/4 cup of warm (110°) water and 1/4 cup of low-fat Greek yogurt into the four and yeast mixture in the bowl. Stir for 30 seconds, adding a little warm water if the dough is dry or a little all-purpose flour if it is sticky (don't add too much flour or the bread will too be dense; you want a light, airy bread, and if you add too much flour as you knead, the dough will become heavy and dry). The dough will not be smooth at this point; it will be shaggy and ragged-looking, which is normal. Kneading will make it smooth and homogenous. Turn the dough out onto a very lightly floured counter and start kneading with your hands. Knead the dough vigorously for 10 minutes, or until it is extremely smooth and elastic. 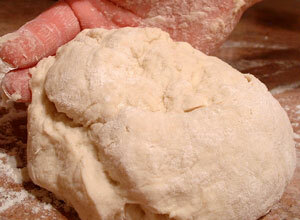 While you knead the dough, add only a tiny bit of flour if needed to prevent sticking. 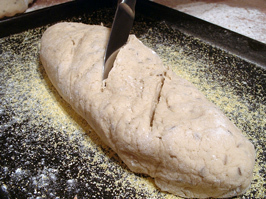 Slap the dough hard onto the counter a few times during the kneading process; this encorages the formation of gluten in the dough, which will result in a lighter, airier bread. 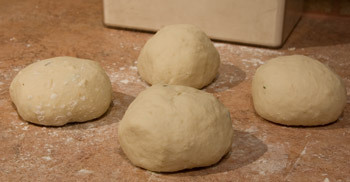 Cut the dough into 4 equal pieces and roll each into a tight ball using your two hands; your two hands should cup the dough as they shape each ball. Place the resulting balls of dough under a dry, clean kitchen towel and set aside to rise at room temperature for 1 hour, or until doubled in bulk. If you prefer, you can set the dough to rise more slowly in the refrigerator, then return it to room temperature before baking (or grilling) it. Dough that rises at a cooler temperature for a longer time develops a more complex flavor than dough that rises quickly at room temperature. You can play with time and temperature to make bread baking suit your schedule: if you don't have a few hours of continuous uninterrupted time, you can knead and shape dough when you have a little free time, then let it rise overnight (or over the course of the day) in the refrigerator and return it to room temperature before baking (or grilling) it later. Or, if you have a long, leisurely morning or afternoon to spend in the kitchen, you can knead, shape, and bake the dough without refrigerating it. Uncover the risen dough balls. On a very lightly floured counter, flatten each ball of dough into a thin disk using your fingertips, being careful not to tear the dough with your nails. Each disk should measure about 8 inches in diameter. If the dough resists your hands and stretches back, give it a rest; the gluten may need to relax a bit. 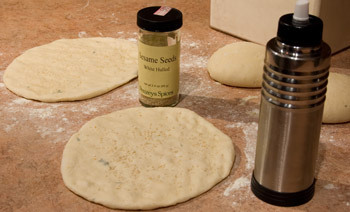 Spray the olive oil on both sides of the dough using a mister (or brush it on using a clean pastry brush). Sprinkle one side of the dough disks with the remaining tablespoon of sesame seeds and press with your hands to make the sesame seeds adhere to the dough. Heat a ridged grill pan over a high flame for 5 minutes. (If you have access to an outdoor grill, by all means, use it!). Grill the disks until they are puffed and browned lightly on both sides, about 2 minutes per side, turning once. Cinnamon and almond are classic flavors in Italy, and they pair splendidly in these moist, tender rolls. Serve with caffe latte for a delicious breakfast or lazy Sunday brunch. Mashed potato lends the dough for these beguiling buns an especially moist texture; instant mashed potato flakes will do in a pinch, but freshly cooked potatoes taste sweeter and lend an airier texture to the finished bread (this is a well-known technique in southern Italy, especially Puglia, where potato is often added to focaccia dough). Another interesting technique in this recipe is adding the butter to the flour mixture before any liquid is poured in, thus coating the flour strands and preventing the formation of gluten, yielding more tender, cakey rolls. By contrast, adding the butter later in the mixing process would allow the flour to form more gluten as it is mixed, therefore resulting in chewier rolls. You can embellish this focaccia dough with caramelized onions, sliced plum tomatoes, bits of Prosciutto… whatever you crave. I still prefer the plain Ligurian version below. Mix the flour, yeast, and 1 tablespoon of the salt in a food processor. With the motor running, add ¾ cup of warm (110°F) water, then pour in 2 tablespoons of the olive oil and add enough warm water (about 1/2 to 2/3 cup) to make a soft dough that forms a ball. If the dough is dry, add a bit of water by the teaspoon; if it is sticky, add a bit of flour by the teaspoon. Process 45 seconds, transfer to an oiled bowl, and shape into a ball. Wrap and let rise at room temperature until doubled, about 1 hour (or let rise in the refrigerator overnight and return to room temperature before proceeding). Without kneading the dough at all, transfer it to a generously oiled round 18-inch pizza pan and push with your fingers until it extends to the sides of the pan (you might need to wait 5 minutes for the dough to stretch more easily). In a small bowl, whisk together the remaining 2 tablespoons of olive oil, 1 teaspoon of salt, and 3 tablespoons of room-temperature water and pour over the focaccia. Spread to the edges of the dough and dimple the dough with your fingers, using the pads rather than the nails so you don't tear the dough. Let rise at room temperature 45 minutes. Meanwhile, preheat the oven with a baking stone in it to 475°F. Place the pizza pan on the baking stone and bake in the preheated oven for 20 minutes, or until golden on the top and bottom and lightly crisp. This chewy, caraway-scented bread from Bolzano, Trentino-Alto Adige's second-largest city, is crunchy on the outside, wholesome, and absolutely addictive. Enriched with yogurt and eggs, only lightly sweetened, and dense, this is the kind of bread that is best enjoyed the same day it is baked, slathered with fresh, unsalted butter and accompanied by savory smoked hams (try a smoked Prosciutto called Speck for a truly authentic regional treat). The use of various grains, a bit of sugar, and spices like caraway and fennel seeds in the dough harks back to Trentino's significant Germanic influence. Combine the rye flour, all-purpose flour, and yeast in a large bowl. In another bowl, beat together the butter, egg, yogurt, salt, sugar, caraway seeds, and fennel seeds. Using a wooden spoon, beat 1 cup of warm (110°) water into the four and yeast mixture in the bowl, then beat in the butter-egg-caraway seed mixture. Stir for 30 seconds, adding a little warm water if the dough is dry or a little all-purpose flour if it is very sticky (note: rye doughs are always stickier and harder to work than wheat doughs, so be patient and don't add too much flour simply to prevent sticking, or the bread will too be dense). Turn the shaggy dough out onto the counter; knead 8 to 10 minutes, sprinkling with a whisper of all-purpose flour if the dough sticks to your hands or the counter. The dough should be smooth, supple, and elastic when you are done kneading. Shape into a ball. Place in a lightly floured bowl and turn to coat lightly with the flour on all sides; cover with plastic wrap and set aside to rise at room temperature for 1 hour, or until doubled in volume. Preheat the oven with a baking stone in it to 425°. Sprinkle the counter with the stone-ground whole wheat flour. Turn the dough out onto the counter over the flour. Cut into 2 equal pieces. Roll each piece into a 10-inch-long x 3-inch-wide loaf. Place on a cornmeal-dusted tray about 4 inches apart, cover with a towel, and let rest 30 minutes. Uncover the loaves. Transfer to a cornmeal-dusted baking peel and slash the top of each loaf diagonally 3 times with a sharp knife or blade. Dust the top with a light sprinkling of flour (the goal is to make the flour form a coating on the dough, not to be incorporated in the dough). Transfer directly to the baking stone; bake 30 minutes, or until golden-brown and the bottom sounds hollow when thumped, misting 3 times with water during the first 10 minutes of baking (be sure to close the oven immediately upon misting the loaves). Make a dough by combining 3 cups of white rye flour, 2/3 cup of all-purpose flour, and 1 tablespoon of instant yeast in a bowl. In another bowl, mix 4 tablespoons of melted and cooled butter, 1 large egg, 1/2 cup plain whole milk yogurt, 2 teaspoons salt, 1 teaspoon sugar, 1 tablespoon caraway seeds, and 1/2 teaspoon fennel seeds. Using a wooden spoon, beat 1 cup of warm (110°) water into the four and yeast mixture in the bowl, then beat in the oil-egg-caraway seed mixture. Stir for 30 seconds, adding a little warm water if the dough is dry or a little all-purpose flour if it is very sticky (note: rye doughs are always stickier and harder to work than wheat doughs, so be patient and don't add too much flour simply to prevent sticking, or the bread will too be dense). Sprinkle the counter with the stone-ground whole wheat flour. Turn the dough out onto the counter over the flour. Cut into 2 equal pieces. Without deflating the air bubbles in the dough or flattening the dough too much, roll each piece into a 10-inch-long x 3-inch-wide loaf. Place on a cornmeal-dusted tray about 4 inches apart, cover with a towel, and let rest 30 minutes. Transfer to a cornmeal-dusted baking peel and slash the top of each loaf diagonally 3 times with a sharp knife or blade. This unusual bread is made with the same dough as the rye bread from Bolzano above, but the shaping and baking procedure is different, yielding crispy, dense flatbreads best savored with hard cheeses and cured, salty hams. Using a wooden spoon, beat 1 cup of warm (110°) water into the four and yeast mixture in the bowl, then beat in the butter-egg-caraway seed mixture. Stir for 30 seconds, adding a little warm water if the dough is dry or a little all-purpose flour if it is very sticky (note: rye doughs are always stickier and harder to work than wheat doughs, so be patient and don't add too much flour simply to prevent sticking, or the bread will too be dense). Turn the shaggy dough out onto the counter; knead 8 to 10 minutes, sprinkling with a whisper of all-purpose flour if the dough sticks to your hands or the counter. The dough should be smooth, supple, and elastic when you are done kneading. Sprinkle the counter with the stone-ground whole wheat flour. Turn the dough out onto the counter over the flour. Cut into 8 equal pieces. Flatten each piece into a disk and dimple and stretch with your hands into a 6" round. Turn to coat both sides of each disk with the flour (the goal is to make the flour form a coating on the dough, not to be incorporated in the dough). Prick the top of each disk numerous times with the tines of a fork (this prevents ballooning in the oven later). Spread the disks out in a single layer on the floured counter. Cover with dry towels and let rest 30 minutes at room temperature. Transfer 4 of the risen disks directly to the baking stone; bake 15 minutes, or until golden-brown on the bottom. Open the oven and turn each disk upside down on the baking stone; bake 2 more minutes, or until golden-brown on the other side too. Remove to a rack and cool to room temperature. This long, airy bread is the Italian cousin of France's baguette. Combine the flour with the yeast and sea salt in a powerful 11-cup food processor. Blend for 5 seconds. Slowly add 1 and 1/4 cups of warm (110 degree) water through the feed tube while the processor is running; the dough should come together, forming a somewhat sticky, smooth ball. Add a little more flour if the dough is wet or a little more water if it is dry. Turn the dough out onto a lightly floured counter. Cut it into 3 equal pieces and shape each into a ball, making sure you don't press out all the air bubbles that have developed (leaving air bubbles intact ensures larger air holes once the bread is baked). Cover with a towel and let rest for 15 minutes. Meanwhile, preheat the oven with a baking stone in it to 475 degrees. If you don't have a baking stone, heat 2 baking sheets instead. Pat 1 ball of dough into a flat 1-inch high rectangle measuring about 4 inches x 5 inches. Fold the side furthest from you over toward you and seal the seam using the heel of your hand. Turn the rectangle 180 degrees, and fold the side furthest from you over toward you; seal the seam using the heel of your hand. Fold the resulting log in half lengthwise, sealing the edges with your fingertips. Roll into a 14-inch-long cylinder with slightly tapering ends. Repeat with the 2 remaining balls of dough. Cover with a towel and set aside to rise at room temperature for 30 minutes; the cylinders should increase by half their size. Slash each cylinder diagonally at 3-inch intervals with a razor blade. Sprinkle lightly with flour. Place on a baking peel that has been sprinkled with the cornmeal and dust with flour; slide onto the baking stone. If you don't have a baking peel, place the loaves on a reversed baking sheet sprinkled with cornmeal and slide them into the oven. Lower the oven temperature to 450 degrees. Bake the bread for 25 minutes, or until it is golden brown and crisp, misting with water from a spray bottle 3 times during the first 10 minutes of baking. (Close the oven door quickly each time to prevent heat from escaping and the bread from deflating.) Cool the bread on a rack and serve at room temperature; alternately, freeze the bread in plastic freezer bags for up to 2 weeks and reheat for 10 minutes in a preheated 350 degree oven. Beware of bread recipes that call for more than 1 tablespoon of instant yeast per pound of flour: your bread will surely taste like yeast, not bread, with that much yeast. Less yeast and a longer, cooler rise result in tastier bread with much more character. Use high-protein flour for chewier, crustier bread. If the recipe calls for any fat (oil, butter, and so on), add it only after some of the liquid has already been added to the flour; otherwise the fat will coat the proteins and prevent gluten from forming as easily as it should. Don't add hot liquid to the dough; anything above 115 degrees might kill the yeast. Knead the dough vigorously and slap it onto the counter a few times during kneading to develop the gluten; the more gluten develops in the dough, the better the dough will rise and the airier the bread will be. 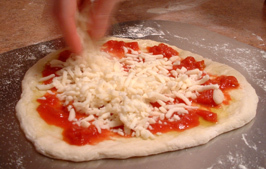 Cover the dough with plastic wrap or a moist towel as it rises; this prevents a fine skin from forming on its surface. 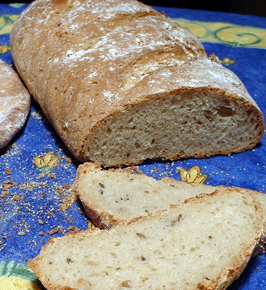 The skin not only mars the final texture of the bread, it also inhibits rising. Slash shaped loaves with a sharp razor blade immediately before baking; this prevents them from bursting at the seams as they expand dramatically in the oven. Make slashes about 1/4-inch deep on a diagonal with a swift, sure motion, not a sawing motion. Bake bread directly on a heated baking stone for an extra-crisp crust and chewy texture. If you don't have a baking stone, heat 2 baking sheets in the oven for 30 minutes instead. Spray the bread with water from a spray bottle 3 times during the first 10 minutes of baking; the steam prevents the crust from forming too early, which in turn would prevent the bread from rising to its full potential in the oven. As the bread bakes, the humidity from the steam will eventually make the crust crisper. Cool bread on a rack to keep the crust nice and crisp; if the air doesn't circulate, the crust will become soggy. The four Wolf ovens at our Manhattan cooking loft are always in use. And nearly every time a cooking class student opens the oven door, I am asked the same questions: "What are those wooden shelves doing in your oven?" Or, if the student has baked bread before, "Why do you keep a pizza stone in your oven?" Those "wooden shelves" are actually baking stones-pizza stones to some-and they serve an incredibly useful function: They draw humidity out of food that is baked on top of them, and they maintain heat consistently from below so food emerges from the oven crisp and golden in a shorter time than if it were baked on a regular oven shelf. We bake focaccia, roast vegetables, oven-sear beef tenderloin on our baking stones… We never remove the stones from the oven (except to clean them, of course). Sometimes (as in the case of pizza) we bake directly on the baking stones, in which case we set the oven to the Pizza Stone setting-more on this below-but most of the time we simply place roasting pans or baking sheets on the stones and let the stones' heat do the magic, while the oven is set on Roast or Convection Bake. I wouldn't bake delicate cakes, desserts, or cookies on a baking stone-I would be concerned about excessive browning-but every other dish can benefit from contact with a baking stone. I am also careful not to place cool glass or terra-cotta bake ware on a hot stone because the heat differential will make them crack. Think of a baking stone as your own mini brick oven. It delivers constant heat, and produces breads and roasted foods with exceptional crispness. Our Wolf baking stones are set on top of a rack that sits atop a dedicated heating element. When the ovens are set on Pizza Stone setting-as opposed to other settings, like Convection Bake or Roast-the heat keeps pumping through the dedicated heating element and onto the stone itself. It is an ingenious mechanism, and one that results in amazing pizzas and breads-especially because the oven recovers heat more quickly when it is set on Pizza Stone than on any other setting, and the stones trap heat which they in turn transfer to baked goods. Below you'll find links to three recipes best baked on a baking stone. If you have a Wolf oven (either Dual Fuel or Electric) and are curious about Wolf's Bake Stones, click here. for more information. If you don't have a Wolf oven but still want a baking stone (without a dedicated heating element), you can order a stone here. 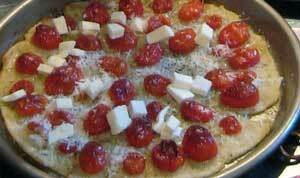 A classic recipe from Puglia, in southern Italy. Boiled potatoes are mashed and combined with flour, and the resulting dough is rolled out thin and topped with tomatoes, cheese, and fragrant oregano. 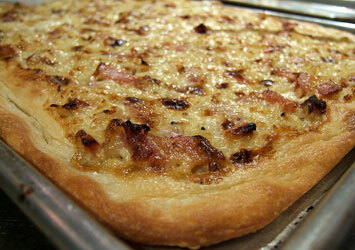 The pizza can be served piping hot but is also delicious warm or at room temperature. It makes a fabulous appetizer served with a glass of crisp white wine, or a lovely main course accompanied by a simple salad. This is one of the best focaccias in Italy: intensely perfumed from olive oil, savory from sea salt, neither too high nor too flat. It bakes up moist and tender but offers a pleasant crunch, and is best savored hot, straight out of the oven. To reheat the focaccia, wrap it tightly in aluminum foil to enclose, and slip into a preheated 350 degree oven for 10 minutes, then unwrap and enjoy. 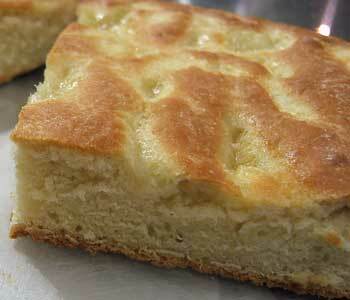 Serve the focaccia as you would bread, on its own or with an assortment of salumi and cheeses. Here it is: The pizza that has made Naples famous the world over. Pizza Margherita was first baked in 1889 by a baker named Esposito in honor of the visiting Queen of Italy, Margherita, and topped with ingredients that recalled the colors of Italy's flag: red tomatoes; green basil; and white Mozzarella. Try our step-by-step recipe for this classic pizza and you'll be amazed at how easy it is to create a memorable (and authentic) pizza at home. Resist the temptation to slap on a lot of toppings; Italian pizzas are delicious in great part because the pizzaioli who make them only put on as much topping as necessary--too much topping will weigh down the dough and make it soggy once baked.